I’m scared, tired, holding no more than a sliver of belief that what I’m doing will make the slightest difference. But tomorrow is my day to show up for the eighth time at Ground Zero for my 9/11 Bowing Project, so that’s where I’ll be heading on the morning train out of Rhinecliff. Because somewhere underneath my fatigue and fear, I also do know that I’ve actually been offered this gift called “infertility” as a training ground for doing the work I’ve been put on this earth to do. Reduce Evil, add to the Good. I’ve been given a chance to discover how much difference one, un-credentialed, un-sponsored, desperately-wishing-for-a-child woman can make, when she stops waiting for someone to do her thinking for her. I’m going tomorrow because it’s my chance to speak up in a particular way-to attempt to engage in a far more meaningful dialogue about the roots of violence; to speak up in a way that makes sense to me. Even if it makes sense to no one else. And…well, there IS one thing that I am wildly curious about. I’m bringing with me some of the beautiful Turn It Around T-shirts that have been sitting in a box in our studio for the last four years. And Kenny Schneidman over at Catskill Art art supply store here in Woodstock, helped me print a strip of paper to attach to my banner that says: Not quite sure what I’ll be asking the peace-workers to do tomorrow, but I’ll figure it out. And it should be fun to see if I get any takers for the job. Wonderful work! How exciting to offer t-shirts and see if there are people who will want to earn them. Yes you are making a difference – even seeing people behaving in challenging ways just a further manifestation of orphans. We all need help with these orphans and then we can raise more peaceful self-aware children. Julia, I believe your work makes a difference. 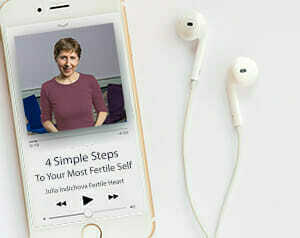 I see just from the fertile heart circles how many women have grown more fertile and then spread the practice or just their own sense of awareness to help others see a different way to think, feel, choose, and act. On a personal level I feel more doors have been opened in relation to changing my family line toward peace and not violence. I believe one persons actions of change make a difference. I will be thinking of you today (9/11)- I hope you know that your work, all of your work, does make a difference to some many different people. You have already made my life more fertile and abundant so I can well imagine the impact you will have at ground zero. Dialogue can sometimes be the catalyst for awakening a heart,a mind, and a soul so I cannot imagine a more sacred space to start a dialogue than that. I totally agree with you and especially your reference to the dialogue being the catalyst. We never know how the human mind reacts and gets connected, it could be a word, a gesture. Julia – I will be very honest with you. I never completely focused on your peace project. Its absolutely that selfish orphan that thinks, first let me have my baby then I will figure out what to do with other things. But slowly I am realizing after reading your innumerable posts on peace projects and specifically after you re-iterate the fact of saving Earth, saving mankind that why am I even linking this to baby journey? How can I be so uncompassionate towards Mother Earth. At least I can do bare minimum things and that causes a difference, may be just 0.00001%. The only reason it gets into our mind is because you are delivering this message to us repeatedly, with unwavering patience and faith.Going to ground zero for the 8th time is definitely not a small thing. It might feel like you are by yourself, but trust me some of us are getting influenced in the right way. And I can speak for myself and say that I am making baby steps in this area to respect Mother Earth and do whatever little I can that at least in my mind makes a difference, even though it might not be noticeable to others outwardly. You are making a difference! You are definitely “adding to the good” by showing us how to walk a more fertile life. 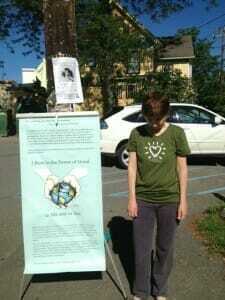 I will do my best to be a peace worker in my neck of the woods! Will be thinking of you at ground zero tomorrow.